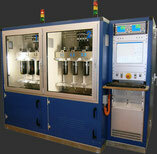 The HP series of hydropulse test systems are used for dynamic internal pressure pulsation of all types of hydraulic parts with defined load profiles (load curve shapes and frequency), for burst pressure testing, for tightness testing and for determining leakage rate. The active system is equipped with the new highly dynamic iterative learning controller (IL control). In combination with sensors with plausibility checking, they ensure the highest degree of reproducibility in the test results.